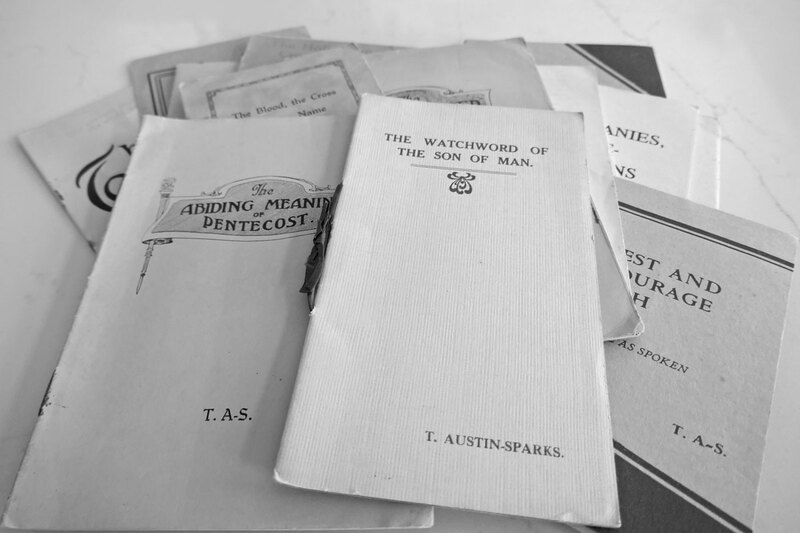 We gratefully acknowledge the work which Paul Redin has done in transcribing and offering these magazines to Austin-Sparks.Net. Unless otherwise noted, words and phrases in square brackets  were added by him. 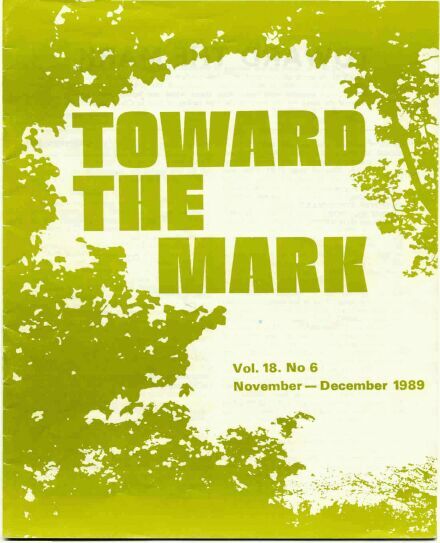 Toward The Mark, a bi-monthly magazine edited and published by Harry Foster, was a continuation of the ministry begun by Mr. Austin-Sparks in A Witness and A Testimony. Mr. W. E. (Bill) Thompson, who has the responsibility and oversight of Mr. Foster's estate, has graciously given his permission to publish on the Internet the articles in Toward The Mark , of which he is the copyright owner, in the form they appear here. The first thing to note about the articles in Toward The Mark is that they are "Christ-honoring". The second thing to note is that they are intended to build up the body of Christ, to be 'spiritual food' for believers, especially Christian workers. As such, they were well received by their readers when originally published. It is my hope that they will be equally well received by many believers today who read them via the Internet. 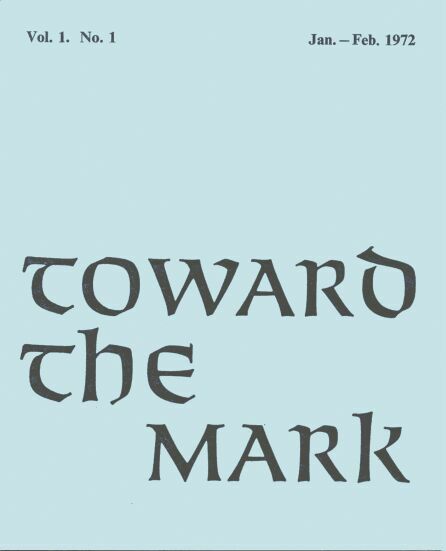 Toward The Mark was published bi-monthly (six issues per year) and was distributed by mail (or 'post') without cost to many appreciative readers. The articles were printed in four columns of text on both sides of five sheets of 9 X 14-1/2 in. paper that, when folded double and fold-stapled together with a folded cover, formed a magazine measuring 7-1/4 in. wide by 9 in. high containing 20 pages of two-column text. The pages were numbered consecutively each year beginning with No. 1, page 1, and ending with No. 6, page 120. The average number of words per issue was about 16,500. The table of contents was on the inside front cover. A title banner was printed at the top of the first page of text in each issue of Vol. 1. Beginning with Vol. 2, this banner was printed at the top of the inside front cover. Also beginning with Vol. 2, a Scripture verse 'motto for the year' was printed on the back cover. See below for images of the front cover. The following notice appeared on the inside front cover of Vol. 1: "There is no subscription for this bi-monthly magazine, but its cost is met by the gifts of appreciative readers." Beginning with Vol. 2 and continuing through Vol. 16, this notice was changed to read: "This bi-monthly magazine is devoted to expository messages from the Word of God. It is sent freely, on request. All the costs are met by the gifts of appreciative readers." This notice was omitted in Vols. 17 & 18. 1. The original two-column page format was replaced by a one-column format with each paragraph delimited by a blank line rather than by first-line indentation. Original pagination is indicated within square brackets embedded in the text. For example, [21/22] indicates the end of page 21 and the beginning of page 22. 2. A short centered line of 16 hyphens was inserted to indicate the end of each article and to separate various other blocks of information. 3. Each footnote was moved to its appropriate place within the text. 4. Each 'em dash' was replaced with two hyphens. 5. Obvious typographical errors were corrected; when doubtful, no change was made. British spelling and punctuation were retained throughout.